According to the New Jersey Juvenile Justice Commission, there were 681 minors in the New Jersey juvenile justice system as of 2015. These young people were adjudicated delinquent for a wide variety of offenses, involving drugs, assault, weapons, property, and violations of public order. As a parent, these numbers become far more significant when it is your child who is thrust into the system. When your child is charged with a criminal offense, the stress and anxiety about his or her future can be overwhelming. Questions about the juvenile justice process, and how best to protect your child, loom large. At this critical moment in your child’s life, finding a knowledgeable, supportive, and aggressive legal advocate can truly spell the difference between one path and another. To discuss your case with Mr. Fay and find the answers to your questions, contact his offices today at 609-832-3202 for a cost-free consultation. You can also see more of Mr. Fay’s client reviews by accessing his individual profile on Avvo.com. In New Jersey, the juvenile justice process is far different from that of the adult criminal justice system. 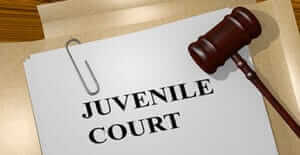 First and foremost, juvenile cases are handled in the Family Division of the Superior Court in the county in which the juvenile lives, not in the Criminal Division. This reflects New Jersey’s commitment to rehabilitation and reform of young people, specifically, those under the age of 18. When you are suspected of committing an offense as a juvenile, you are not “arrested,” but instead, are “taken into custody.” Similarly, you are not charged with a “crime,” but instead, are charged with an act of “juvenile delinquency.” Under New Jersey law, an act of delinquency refers to an act by a juvenile under the age of 18 that, if committed by an adult, would constitute a crime, a disorderly persons offense, a petty disorderly persons offense, or a violation of any other penal statute, ordinance, or regulation. It is important to note that New Jersey provides a variety of alternatives to incarceration for juvenile offenders, ranging from book reports, to education programs, and community service. While an outright dismissal is always the ideal outcome, there are many ways of successfully resolving these cases if a dismissal is unlikely. Mr. Fay works tirelessly to deliver the best possible results to his clients, to allow young people and their parents to move forward unscathed by the juvenile justice process. He is passionate about assisting juvenile clients in pursuing their brightest futures. If you or your child has been charged with a juvenile offense in Camden County or elsewhere in South Jersey, it is essential to understand your rights and your legal options. Contact our firm at 609-832-3202 for additional information and a cost-free consultation.